The Amish Console Picture Frame with Sliding Door provides a beautiful display case for your living room, family room or foyer. This curio cabinet provides room for a doll or teacup collection to stay protected and dust free. One large picture frame sliding glass door opens smoothly for access to your collectibles. This amish made curio cabinet allows you to display and enjoy your collection instead of having it concealed in a shoebox on a closet shelf. The surface of this glass curio cabinet provides a nice space for some family photos or a vase of flowers. Positioned in your entryway, this solid wood cabinet offers a warm welcome. Explore our collection of Amish Curio Display Case Cabinets to find the one that best reflects your style. This Console Picture Frame curio offers a mirror back with a sliding door on the front. Two adjustable shelves provide the room for your items and a touch lighting system provides gentle lighting. 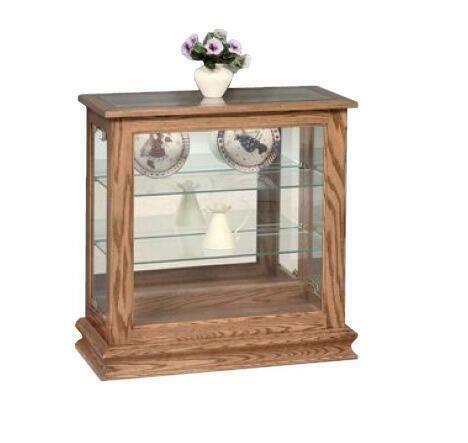 Customize this Amish curio cabinet with beveled glass or additional shelves. This is a cabinet that is Amish made in America and will serve your family for generations to come. Call us today, toll-free at 866-272-6773 with any questions. We are always happy to help.